*Sees a bunch of white kids in the future running around with their arms behind them* What did you just do!?! @JewishXenu, Stormbreaker is actually symbolically representative of the power of anime, and that's why I can counter the completed Infinity Gauntlet. @phalcon , pretty much only aircraft carriers, some pretty badass ships were sunk. @phalcon , to add onto what @Curmudgeon , said, Pearl Harbor was known as the party base. The best of the best were not sent there. If you were sent to Pearl Harbor, you were unlikely to see action and would most likely spend your time partying. Which is another reason why the attack was so shocking. @phalcon , also I believe I saw something that mentioned that the Japanese were operating on intel that the carrier fleet was supposed to be in dry dock that day, but had been scrambled for some exercise or another. Now whether that was a coincidence or deliberate is up for debate. @phalcon , you loony conspiracy theorist? If you don’t worship the troops then you can leave America. @phalcon , we didnt know aircraft carriers were the best ships. They targeted battleships because those were the ship of the line then, and they sunk most of them. America adapted by relying on aircraft carriers after that. Dr. Stephen Strange : I went forward in time... to view alternate futures. To see all the possible outcomes of the coming conflict. Peter Quill : How many did you see? Dr. Stephen Strange : Fourteen million six hundred and five. Tony Stark : How many did we get anime? Dr. Stephen Strange : ...One. 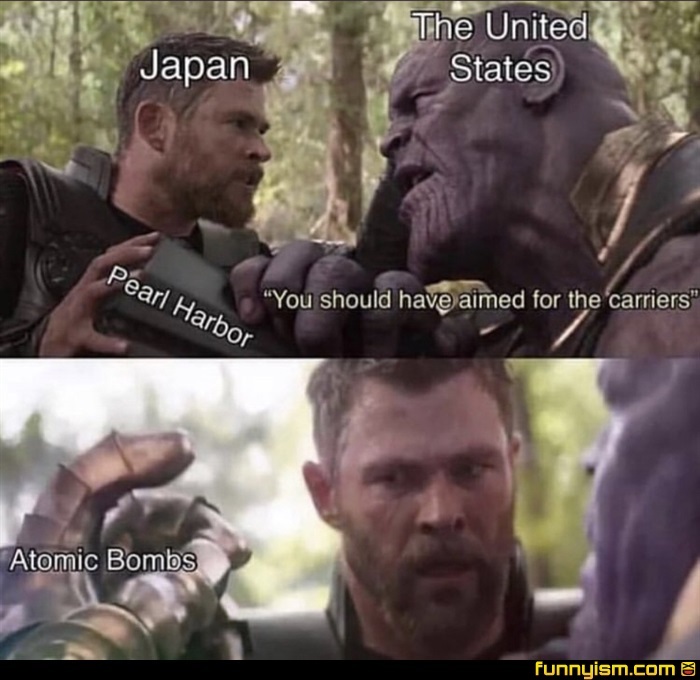 Why did Japan bomb Pearl Harbor? Wrong answers only. @a boy named Toobs, It was their awkward middle school way of inviting the USA to a party. @a boy named Toobs, they attempted to shock the US out of joining the war. In theory, their attack should have crippled the US's response by eliminating their strongest western sea base, but the attack target mostly the battleships and not the harbor's fuel supplies or docks, and that was their mistake. Had the harbor been destroyed, it would have taken the US years to mobilize a force that could supply itself and reach Japan at which point Japan would have conquered the Pacific. Instead the Japanese bombers were told to hit the "biggest threat" the battleships which, though sunk, were easily pulled up out of the water and recycled to build other ships. @a boy named Toobs, Pearl Harbor is also what started the seabees.